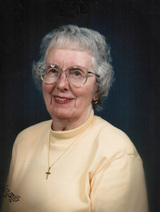 Louise Fetterolf Obituary - McDonald, Pennsylvania | Richard F. Thomas- Robert W. Little Funeral Service Inc.
Louise, 91, passed away in Pittsburgh on December 28, 2016. She follows her husband, Donald James Fetterolf, who died March 10th, 2001. Born on August 3rd, 1925, she was the daughter of Merritt W. and Katherine Claus Pedrick of Scranton, PA.
She was a graduate of the former Central High School, Scranton, PA - Class of 1943. She worked in the bookkeeping department of International Salt Company, as a secretary at the United Church of Christ in Scranton and as science faculty secretary at the University of Scranton. She was a member of the Hickory Street Presbyterian Church in Scranton for many years, where she served as a church elder, moving to the Pittsburgh area within the past decade. She had two sons, Dr. Donald Fetterolf, currently living in Oakdale, PA and Eric Fetterolf, Gloucaster City NJ, now deceased. Also surviving are two brothers, M. Wesley Pedrick, Pittston, PA and Edward Pedrick, Pottstown, PA and several nieces and nephews. All arrangements are private and are entrusted to Thomas-Little Funeral Service, Inc., 314 W. Lincoln Avenue, McDonald (724-926-2800). To send flowers to the family of Louise P. Fetterolf (Pedrick), please visit our Heartfelt Sympathies Store.